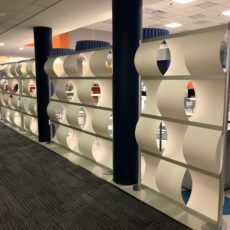 United Technologies Research Center, located in East Hartford, CT, expands the boundaries of science and technology through research and innovation. 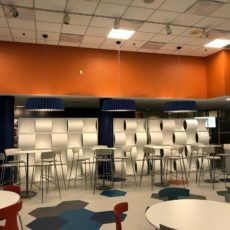 Functionality and design aesthetic were carefully considered when planning their cafeteria renovation. 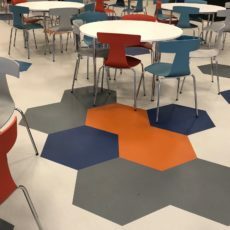 OFI provided construction services, furnishings and flooring showcasing bright colors, bold patterns and purposeful design. This multi-functional space was designed for quick and easy reconfiguration. High density stacking chairs and folding tables can accommodate changing layout needs. 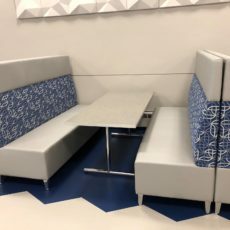 Acoustical panels to reduce noise and custom light fixtures bring a dynamic design element with custom fabric covering booths. A number of manufacturers are represented in the space, including: National Office Furniture, Falcon, Loftwall, ICF and Unika Vaev.